Catalan activists raise their hands at Barcelona's Catalonia Square after a silent march to protest police violence during the secession referendum at October 1st. PAimages/Matthias Oesterle/Zuma Press. All rights reserved.When I see a picture of a middle-aged woman, dressed in her ordinary clothes and standing outside one of the prohibited polling stations somewhere in Catalonia, with blood trickling down her forehead, my immediate response is a feeling of dismay. In one of Europe’s youngest, but most animated democracies, how has it come to this? For centuries, political thinkers from Niccolò Machiavelli to Carl Schmitt have understood conflict as an inherent part of politics. Today’s political headlines from around the world would no doubt lend support to their claims. But with popular political expression unlocked through the democratisation of our societies, more than ever we need to carefully navigate this polarising effect of politics. Democracy offers the grey space between ‘us-them’ nature of politics, but it requires more than simply calling a referendum. Europe, the self-proclaimed vanguard of democracy, is increasingly coming face to face with the complexities and contradictions of democracy. It is easy to cite free and fair elections; the rule of law; social and political rights; the separation of power, or broader principles of transparency and social justice as necessary components, but their application, within a particular historical and social context, can look very different from one society to another. Hence why we see some democracies content to maintain a monarch as the constitutional head of state, where republicans would baulk. Or why many societies have evolved to elect representatives to manage their communities’ political matters, as opposed to the constant engagement of citizens with the day-to-day running of the country. Unsurprisingly, what we are witnessing, not only in Europe but around the world, are societies locking horns with such conundrums of democracy. The relationship between Spain and the autonomous region of Catalonia poses one itself: how to preserve the basic right of self-determination – which has shaped the global landscape since the US President Woodrow Wilson started the de-colonisation engine in 1918 – with the country’s constitutional integrity. Like the vast majority of democracies, Spain employs a representative system to govern the country and protect the democratic rights of its citizens. The theoretical flaws of this system, which fill political textbooks at universities, are nothing new, but are receiving an increasing number of real-world case studies to complement them. In Spain, representative democracy has failed the autonomous region of Catalonia. The region has consistently sent pro-independence representatives to the national parliament in Madrid. Afraid of constitutional crisis that would ensue if claims for Catalan secession were acknowledged, the capital has been unable to manage the issue with numerous political clashes over the years. Meanwhile, everything from the constitutional court overturning Catalonia’s controversial ban on bullfighting in 2016 to “preserve common cultural heritage”, to the high cost of motorway tolls in the region compared to the rest of the country have been politically framed as part of the secession debate. Despite this, popular support has ebbed and flowed, by never dominated outright. Nevertheless, any admittance of the secessionist claims by means of democratic debate in parliament would undermine a united Spain (bearing in mind there are other autonomous regions with a history of claiming secession from Spain, most notably the Basque country). It has therefore been a red line. This has led Catalonia to pursue alternative tools to system of representation, the recently popular poster child for direct democracy: the referendum. It is a strong tool for democracy, just look at Switzerland. In 2017 alone, the country held seven referenda which guided the government on issues of pension reforms, the country’s energy strategy and immigration. Turnout sits at around 46%. But whilst these referenda clearly support their citizens’ right to self-determination, none would question the constitutional integrity of the 26 ‘cantons’ that constitute the Swiss confederacy. More importantly, the rich tradition of direct democracy in Switzerland has evolved over centuries, and is protected by a constitutional framework. It guarantees the safeguards of imbedded expert guidance, citizen education and ongoing public consultations throughout the process to ensure the process is democratically regulated. What you won’t find is standalone, one-off referendum. Having the right constitutional framework around referenda, as a tool of democracy, is absolutely essential. Without it, referenda risk being manipulated and used in bad faith. In this sense, a referendum can actually lead to the undermining democracy. Just as humanity discovered fire as a tool to cook, warm family homes and light our streets, so too has it been used to burn down villages. Colombia’s plebiscite to validate its peace agreement with the FARC and the UK’s Brexit referendum offer two illustrations of this. In both cases, poor public consultation in the build-up, a lack of objective information sources for citizens outside of the polemic media channels and no robust vision of what the alternative looks like meant that the public emotions were freely manipulated by invested politicians – on both sides of the debate. The fact is that in Catalonia, representative democracy has not worked, and the region now deserves some form of public consultation. However, this consultation should not be a standalone vote, unsupported by some kind of framework as described above, and should certainly not be organised in isolation by local politicians with a vested interest in the result. More so than ever an international framework is needed to regulate the legality of unilateral secessions. The UN Charter is unsuitable, outdated and preoccupied with the era of decolonisation, which posed very different challenges to those we are facing today. In Article 2(1), it’s call for ‘equal rights’ and ‘self-determination’ offer little guidance on whether a community has the right to separate from a parent state. Similarly, while there are numerous historical cases from the international community from which we might seek precedence, they offer as much contradiction as guiding consensus. Instead, a framework must be developed that is structured enough to protect democratic principles and public security, yet flexible enough to adapt to each country’s distinct democratic and historical context. The Catalunya question should not be treated the same as Scotland, nor Palestine, nor Kurdistan. Nevertheless, they should all be able to draw upon guidance from the international community on how to enter a process of public consultation, in order to guarantee the democratic rights of citizens across the world. This argument is unlikely to be popular in the wake of Catalonia’s unofficial referendum. For the independentistas, it offers no immediate solution, and indeed no guarantees. Politics so often urges us to strike while the iron is hot, as the leader of the Catalonia government, Carles Puigdemont’s declaration that the region has won its “right to statehood” shows. But for those ardent supporters of a united Spain, an international framework that offers guidance and rights to enter a full and democratic public debate on secession poses a threat to the country’s constitutional integrity, and is unlikely to be supported by national governments. Be that as it may, we as citizens must realise the referenda are not unquestionably democratic, nor is prohibiting them where the correct conditions are absent necessarily undemocratic. In the case of Spain, the country must also accept that representative democracy, as so far let Catalonia down, and it must not either pursue constitutional reforms or a democratic consultation in the coming years to address the issue. There is a long list of communities that are seeking to bring greater democratic governance within their own ethnic, cultural of national borders – and that list is only likely to get longer. 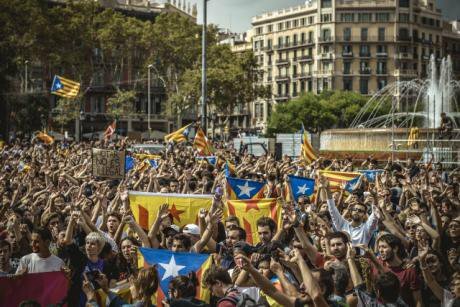 Spain still has an opportunity to understand its own internal claims for secession in a truly democratic manner, and set a precedent for the international community to build upon.